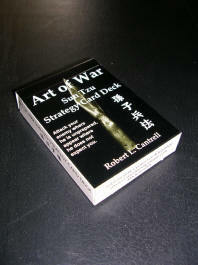 Today’s lesson from the The Art of War Sun Tzu Strategy Deck comes from the wildcard, the black Joker titled, “Sheath Your Sword” Strategy-Deliberately present your adversary with an opportunity that empowers him to accept your terms. Basis-Empowering your adversary to accept your terms provides him with an honorable way out of the engagement. Sometimes we cops get caught up in the physical dimension of conflict and all too often take an attrition based approach to solving problems. If we are challenged with the threat of force, verbally or physically quite often, we react with equal or greater force. However there are times in our efforts to gain control we need to give control to your adversary or “make him think he has control” if we are to gain an advantage. Sun Tzu says, “If we do not wish to fight, we can prevent the enemy from engaging us even though the lines of our encampment be merely traced out on the ground. All we need do is to throw something odd and unaccountable in his way.” Something odd and unaccountable could simple be in something the person we are engaging is not expecting like a tactful albeit tactical conversation. Verbal judo the method taught by the late George Thompson immediately came to mind when I pulled this stanza “sheath your sword” from the card deck. Sheath your sword, I see as a metaphor for the cocked tongue, fist, OC spray canister, baton, taser or, gun, readily available for use when reasonable and necessary. However, an average cop could change the entire response he gets by simply starting every verbal encounter he can with asking rather than telling people what to do. “Sir, could I ask you to step over here for me please?” Rather than, “Hey, come over here!” Everybody likes to be asked; nobody likes to be told. And if you listen tactically, you can gain the advantage through the person who voluntary complies. “Driver’s license, please!” Beginning a verbal encounter with an order like this is sure to generate resistance, said Dr. George Thompson, the founder of the Verbal Judo Institute. Instead, try Thompson’s eight-step meet-and-greet, illustrated below with the example of a vehicle stop. Identify yourself and your department: “Officer so and so, with Any town, PD.” Providing your name shows, confidence and professionalism, and also makes it harder for the person to insult you. Providing the department name adds power. Ask for justification: “Is there some justified reason for failing to stop at that sign today, sir?” Pause for the first time. By providing your name and reasons up front, you reduce the grounds for resistance. Watch and listen to the person’s response for clues on how to handle him. Ask for a driver’s license (or other identification). If you suspect the person is armed, ask: “Sir, do you have your registration and insurance with you; if so, where do you keep it in the vehicle?” followed by, “Is there anything in that area that might cause me concern?” Watch the person’s reaction for hesitation or other signs that he’s hiding something. Provide your decision (warning, ticket, notice of next steps, etc.). This ability to tactfully and tactically interact with people empowers them to thinking and acting on your terms with voluntary compliance. This empowers you to control the situation through them, with your sword sheathed. When utilizing this method anything but cooperation or compliance should be a warning sign something is amiss and requires you to adapt effectively to the changes you observe.